President Trump’s State of the Union speech kicked off the year with some dramatic gestures toward “global leadership,” promising to put the United States at the forefront of a crusade to end the AIDS crisis worldwide. But between the lines, Trump’s global humanitarian agenda is actually undermining health care in the communities most deeply afflicted by HIV/AIDS. Trump’s boasts about tackling the AIDS crisis fly in the face of one of his key foreign-aid policies: the so-called Global Gag Rule. As one of Trump’s first executive orders, issued just after the 2017 Women’s March in Washington, the rule expanded a Reagan-era policy barring US funding for family-planning services that could be deemed to be supporting, referencing, or even explaining abortion in any way. Under previous Republican administration, organizations receiving State Department aid had to agree to anti-abortion speech restrictions, regardless of the host country’s abortion laws, in an effort to extend the anti-abortion agenda of US conservatives overseas. Groups would either have to censor the medical advice they gave to clients or face devastating funding cuts if they could not—or were unwilling to—comply with Washington’s directives. In recent weeks, Trump has doubled down with a domestic version of the gag rule—a newly issued rule that restricts all care and counseling related to abortion through health programs for low-income communities, known as Title X. The cumulative impact of the global and domestic gag rules has been a worldwide frontal assault on medical ethics, gender equality, and HIV/AIDS care in vulnerable populations, at home and abroad. Studies on the long-term impact of the gag rule, under both the Trump and Bush administrations, link the policy to devastating impacts on local health-care infrastructures, including the closure of clinics and cutbacks to distribution of contraceptives. 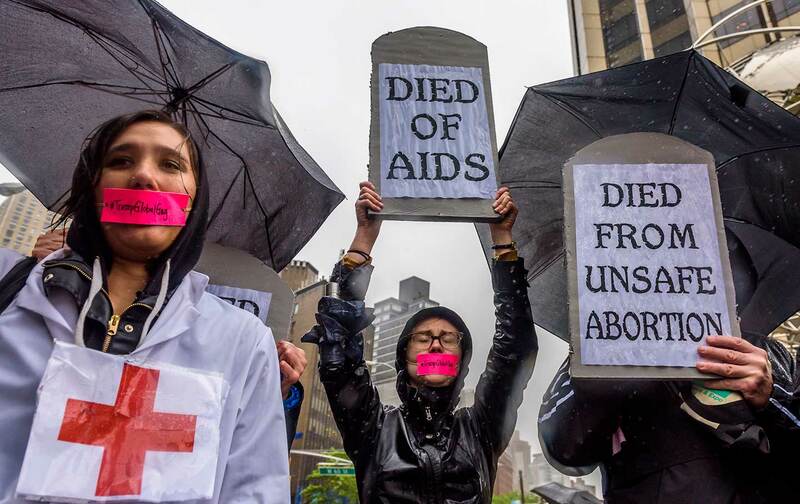 Though the gag rule is primarily aimed at abortion, the restrictions it places on health-care provision have also been linked to an ongoing erosion of HIV/AIDS-related public-health aid in the Global South. The gag rule is creating massive resource gaps across the public health-care infrastructure in many poor regions of the world. For example, Uganda’s wide-ranging public-health initiative, Reproductive Health Uganda, suffered a 30 percent budget cut (about $300,000), which triggered the closure of several major outreach projects. The loss particularly affects HIV/AIDS programs, which constituted about 70 percent of US aid for Ugandan NGOs in 2015, or about $46 million. In amFAR surveys of PEPFAR-funded organizations, about a third of respondents across 31 countries had altered their services because of the gag rule. The result was “a reduction in the provision of critical non-abortion-related information, including for contraception and HIV.” The greatest impact on services, according to the analysis, was “documented in countries with major HIV epidemics, such as South Africa, Eswatini, and Mozambique.” Access to funding has been blocked for programs such as adolescent health counseling, local condom distribution, and HIV testing, with some programs being driven to shutter completely. In Kenya, Evelyn Samba, Kenya Country director for the German humanitarian group DSW, described how the gag rule has exacerbated existing gender barriers and undermined women’s reproductive and sexual rights. Many women have lost control over their sexuality because they no longer have access to life-saving information on sexual reproductive health…. adolescent girls in the worst affected parts of Kenya have lost their ability to make informed choices and negotiate for safe because they no longer have to condoms and to contraceptives. Though Trump boasted about aiding impoverished women and combating HIV/AIDS around the world, in communities most impacted by his anti-abortion agenda, Washington’s “humanitarian” salvation is a poison pill. For HIV/AIDS-afflicted communities in the Global South, people without basic access to contraception, and remote villages that depend on threadbare humanitarian aid clinics for supplies of life-saving drugs, the gag rule that purports to “protect life” could end up being a death sentence.